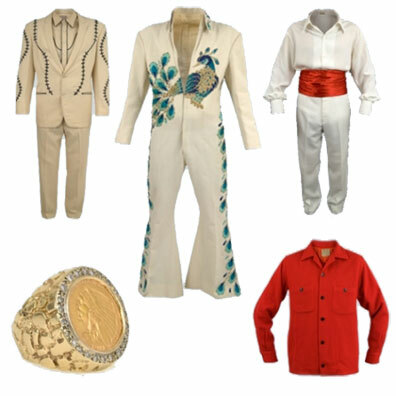 Rock And Roll Auction Offers Unique Elvis Items - Misc. Fans with a large filled piggy bank can spend their money in an online auction, starting today – ending August 6. About 16 unique personal and Elvis related items are up for sale. The eye catcher is the Peacock jumpsuit with a start price of $250,000, est. sale price $325,000. Other clothing from the movies ‘Clambake’, ‘Kissin’ Cousins’ and ‘Blue Hawaii’ is also available. A ring that Elvis wore on stage has to cost $9,500 , while the catalogue also offers ‘cheaper’ items as acetates and autographs. There could be some questions raised when it comes to the Grammy award for ‘He Touched Me’. The three Grammy’s that Elvis received are all on display in Graceland. It is not clear from who, where and when the Grammy in this auction is offered. wheni said the white suit with stitching was cut up i meant the clambake suit, not the peacock suit. as for saying it was not cut up, unless the rca people kept some of the items i still maintain it was cut up. i've seen the pictures of the clothes geting checked over before being cut up for the box set. Dont believe anything Lichter says! Hey K.O.T.J where are you getting your info from? As for the suit being cut up, that is totally wrong. First off the box set came out years before he wore the suit, and the suit was given to Lichter. From there it went to the Elvis musuem in Vegas. The Clambake suit and the Peacock are both real. The things I am suspicious of are the red jacket and the "Blue Hawaii" costume. Like Jim i thought the white suit got cut up for the box set. Have a few envelopes somewhere with swatches in have to find them and see what material i have. Please do not say they this is the only and original peacock suit... Graceland and EPE, are you sleeping??? Much, but not all, of these items are authentic. This same site sold a phony "Eagle's Nest" poster from 1956 a few years ago, as first reported by yours truly at FECC via a GOLDMINE magazine ad. For the record, I broke this story first on FECC but I agree that "Elvis Matters" - and his Grammy should not be sold like this. EPE - where are you? If it is the REAL Peacock Suit, I hope someone will buy it for the purpose of donating it to the Graceland archives. Then it would be where it SHOULD be! I wish I was a millionaire. No, make that a billionaire! just looking at the pictures, did the white suit with the stitching not get cut up for the 4lp box set, (own a piece of elvis' wardrobe)? there is a photo of then president of RCA Rocco Laginestra trying it on in thebooklet in the 2cd boxset the other sides. how much stuff did Elvis give away daily? how did he find the time to perform in concert? how real are these items. how many are reproductions and people assume they are real? Why are they selling all of his stuff? Is this EPE or from private collections? Surely they are not selling his grammy! That is a new low!